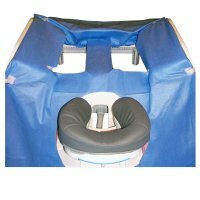 CLMed.com proudly introduces a revolutionary patent pending draping system for MRI breast coils. These drapes will minimize the daily cleaning routine of coils as well as ease the mind of clientele. The drapes provide comfort to patients, while providing protection from contagious diseases such as MRSA. Finally, your staff will be delighted with your decision to simplify clean up between patients, thus achieving a greater throughput. Provides complete coverage and protection of all Sentinelle Breast Coil Products. Total Coverage - added an extra 60” in length now covering the entire table which eliminates costly usage of sheets and provides quick procedure turn around.